This year’s presentation is a Paul Reed Smith S2 Custom 24 electric guitar displaying one of Sam’s most brilliant designs yet. A beautiful All-American theme adorns a flamed maple wood body with a red finish and a red and silver metal flake clear coat. 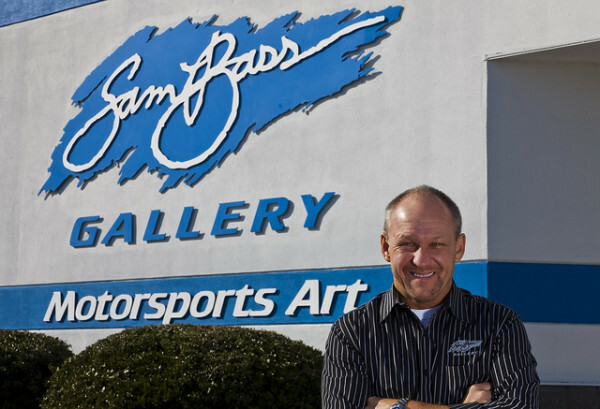 To read more about Sam’s guitar originals created over the years for the Daytona 500, the annual NASCAR Sprint Cup Awards ceremonies, and trophies awaiting race winners in Victory Circle, visit www.sambass.com. Also follow posts on Facebook and Twitter. PRS Guitars was founded by guitarist Paul Reed Smith in 1985 and is one of the premier guitar makers around the world. Located in Stevensville, MD, the company has a reputation for creating high quality instruments and amplifiers that are both reliable and beautiful. TALLADEGA, AL – Watching 43 cars pack race three- and four-wide at 200 mph around NASCAR’s biggest and most competitive race track – Talladega Superspeedway – has always been a “Must See” event. But now, thanks to a valuable video enhancement initiative launched by International Speedway Corporation (ISC) for 2014, it’s going to be much easier to take in the view of views in NASCAR, beginning with the Aaron’s Dream Weekend set for May 2-4. Talladega Superspeedway will serve as a test track for the new ISC program, which will strategically place four large Sprint Vision Digital High-Definition video screens along Talladega’s frontstretch. The new video boards will offer all fans in every grandstand unbelievable views of the incredible content to be projected throughout the event weekend. The screens will almost double the size of former Sprint Vision screens, and the high-definition picture will be crisper, clearer and brighter. With Talladega leading the way, the multi-phase project plans to implement the video boards at all ISC facilities over the next few years. Initially the screens will be temporarily put into place, allowing facilities to listen to fan feedback to create the best digital experience possible. Eventually, permanent digital board locations will be installed as part of the ongoing phase of the initiative. The view will be extra special for kids 12 and under, who will get in free to all grandstands for Saturday’s full day of activity. On Sunday kids receive $50 off the regular price of grandstand seating. Saturday, May 3 features two races – the International Motorsports Hall of Fame 200 ARCA Racing Series Presented by Menards event and the Aaron’s 312 NASCAR Nationwide Series race – as well as NASCAR’s new Coors Light Pole Qualifying format for the Sprint Cup Series, which will consist of three elimination rounds of pack racing. The winner of Sunday’s always unpredictable Aaron’s 499 NASCAR Sprint Cup Series race is all but guaranteed a spot in NASCAR’s Chase for the Sprint Cup at the end of the year, as a result of NASCAR’s recent changes to the Chase. SMOKE FREE throughout the grandstands; designated smoking areas will be set up under the grandstands and towers. Driver Introductions Pit Pass Upgrade; the $50 Pre-Race Pit Pass can now be upgraded to include access to driver introductions for an additional $25. Reserved Saturday Grandstands; all grandstand seating will be reserved on Saturday instead of General Admission to allow fans to find their perfect spot ahead of time. NASCAR returns to Talladega Superspeedway in 2014 with the Aaron’s Dream Weekend, which is set for May 2-4. The NASCAR Nationwide Series will take to the track on Saturday, May 3 while NASCAR’s Sprint Cup Series machines take the green flag on Sunday, May 4. For ticket information, log onto www.talladegasuperspeedway.com. Pocono Raceway and Dover International Raceway will be hosted the second annual Daytona 500 watch party at XFINITY Live! Philadelphia on Sunday February 23. The event will start at 12pm and will be broadcast on the 32-foot Sony High Definition television screen at the center of the NBC Sports Area venue. In addition to viewing “The Great American Race,” fans in attendance can enter to win a number of great prizes, including NASCAR Sprint Cup Series tickets to both the June 1, 2014, race at the Monster Mile and the June 8, 2014, “Pocono 400” at The Tricky Triangle, as well as, some autographed NASCAR memorabilia. The first 60 fans to arrive will have their choice of a pair of tickets to either the Friday, May 30 “Lucas Oil 200” NASCAR Camping World Truck Series race or the Saturday June 7 “Pocono 200” ARCA Racing Series race. If you would like to go, the address for XFINITY Live! is 1100 Pattison Ave., Philadelphia, PA 19418. There is no word in the release who will represent each track at the event, but I suspect Brandon Igdalsky will be there and he is always entertaining. If you’re lucky, maybe they will even give out unspecified prizes like Pocono always does at the tweetups. Either way, I’m sure it will be a good time, watching the race on that big of a screen with fellow NASCAR fans. 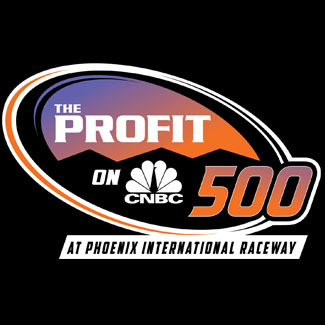 PHOENIX, Ariz. – Phoenix International Raceway will kick off its 50th anniversary season with four big days of NASCAR action Feb 28 – March 2, headlined by The Profit on CNBC 500, Presented by Small Business Fueling America NASCAR Sprint Cup Series race on March 2. The green flag will drop on the second NASCAR Sprint Cup race of the season, The Profit on CNBC 500, at 1 p.m.local time on Sunday, March 2. Spectator gates open will open at 8 a.m.
Set to begin at 1:45 p.m. on Saturday March 1 is the Blue Jeans Go Green™ 200 presented by Cotton, The Fabric of Our Lives® Nationwide Series 200. Spectator gates will open at 9:00 a.m., giving fans the chance to view the NASCAR Nationwide qualifying at 10:10 a.m. and the final NASCAR Sprint Cup Series practice at Noon. On Friday, Feb 28, the second stateside running of the Toyota 120 NASCAR Mexico Toyota Series begins under the lights at 7 p.m. Gates will open at 10 a.m. so fans will have the chance to watch the NASCAR Nationwide Series practice at 11 .m. and NASCAR Sprint Cup qualifying at 4:40 p.m.
Race weekend action will begin on Thursday, Feb 27 with the Talking Stick Resort 75 NASCAR K&N Pro Series- West season opener at 5:00 p.m. Spectator gates will open at 9:00 a.m., giving fans the opportunity to check out the NASCAR K&N Pro Series- West practice at 9:00 a.m. and 10:30 a.m., with qualifying at 1:30 p.m.
Tickets to the exciting Feb 27-March 2 The Profit on CNBC 500 NASCAR event weekend are available with prices starting at just $25. For more information or to purchase tickets, visit www.phoenixraceway.com or call 866-408-RACE (7223). DAYTONA BEACH, Fla. – Gary Sinise, actor, humanitarian and founder of the Gary Sinise Foundation, will wave the green flag as the Honorary Starter at Daytona International Speedway for the 56th annual Daytona 500 NASCAR Sprint Cup Series race scheduled for Sunday, Feb. 23 at 1:00 p.m. ET (FOX). “It’s an honor to be selected as Honorary Starter at this year’s Daytona 500 on behalf of the Gary Sinise Foundation. The race is a celebrated tradition and an important occasion to raise awareness and support for the men and women who serve our country”, said Sinise. 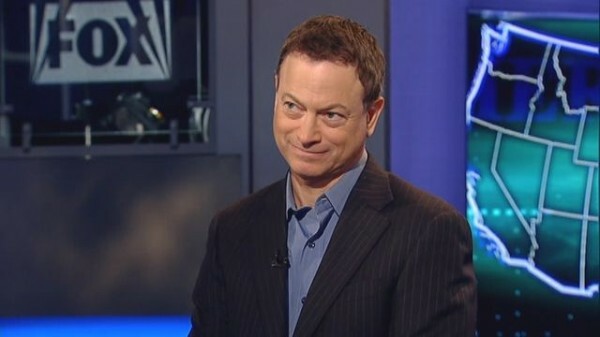 Acting for more than 30 years, Sinise has had many memorable roles in movies such as Forrest Gump, Apollo 13, Ransom and Truman as well as the television police drama CSI: NY. He has earned a Golden Globe Award, an Emmy Award, two Screen Actors Guild Awards and an Academy Award nomination. A long time supporter of the military and veteran community, in 2008 Sinise received the Presidential Citizens Medal from President George W. Bush, the second-highest civilian honor awarded to citizens for exemplary deeds performed in service of the nation – he’s only the third actor ever to receive this honor. In 2011, he founded The Gary Sinise Foundation to honor and serve our defenders, veterans, first responders, their families and those in need by creating and supporting unique programs designed to entertain, educate, inspire, strengthen and build communities. These programs include its R.I.S.E. Outreach (Restoring Independence and Supporting Empowerment), whose flagship initiative is a custom Smart Home building project for severely wounded veterans, some of who will be attending at Daytona with Sinise. Each home is customized to ease their daily challenges and help restore independence with features like retractable cook tops, cabinets and shelving, elevators and more, all accessible via an iPad. Other programs include Relief & Resiliency Outreach, Invincible Spirit Festivals, Serving Heroes and Arts & Entertainment Outreach. The Foundation has also partnered with GE on their Get Skills to Work program to help veterans translate military skills into advanced manufacturing jobs while empowering employers with tools to recruit, onboard and mentor veterans. Additionally, Sinise has toured in support of the troops both home and abroad with his Lt. Dan Band, his 12-member cover band. Performing pop hits to classic rock staples, they’ve played for over half-a-million troops and their families since 2004. More information on The Gary Sinise Foundation can be found online at www.garysinisefoundation.org and on Twitter (@GarySiniseFound). For more information on tickets for the 56th annual DAYTONA 500 and Sprint FANZONE/Pre-Race access, race fans can go online at http://www.daytonainternationalspeedway.com or call 1-800-PITSHOP. CHICAGO and DAYTONA BEACH – International Speedway Corporation (NASDAQ Global Select Market: ISCA; OTC Bulletin Board: ISCB) (“ISC”) today announced a groundbreaking, multi-year partnership withToyota Motor Sales (TMS) U.S.A., Inc. that will make Toyota the first Founding Partner at Daytona International Speedway as part of its unprecedented $400 million DAYTONA Rising redevelopment project. DAYTONA Rising is ISC’s complete reimagining of the fan and sponsor experience at its iconic Daytona International Speedway, a multi-year project encompassing the Speedway’s nearly one-mile long frontstretch that, upon completion in January 2016, will create a world-class facility with premium amenities unmatched in the industry. Financial terms of the agreement were not disclosed. Beginning in 2015, the 11-year agreement will provide Toyota with naming rights for one of five fan injectors. The massive, new and redesigned entry statement includes over 20,000 square feet of Toyota engagement and fan experience that vertically spans four concourse levels. The Toyota brand will also have a presence in the new “World Center of Racing” zone, the central “neighborhood” overlooking Daytona’s famed start/finish line inside the new frontstretch facility. The “World Center of Racing” zone is roughly the area of two football fields where Daytona International Speedway, its partners and race fans will celebrate the history and legacy of racing at the iconic motorsports venue. Fans will be able to socialize and enjoy themselves in this area prior to, during and after a race. Ten additional neighborhoods, each the size of a football field, will be located throughout the new frontstretch with custom bar, retail and dining areas, as well as dozens of video screens to provide fans with non-stop views of on-track action while they mingle with friends. Toyota will also have branding rights to a neighborhood near the Toyota injector. Additionally, Toyota will serve as an official partner of “The Great American Race,” the DAYTONA 500®, and will receive official pace car rights in 2015. The partnership was announced today at the Chicago Auto Show, the same location where Toyota initially revealed its plans more than 10 years ago to participate for the first time in NASCAR, as part of the NASCAR Camping World Truck Series. “This is a unique opportunity for Toyota to elevate our brand in the motorsports community, especially through the DAYTONA Rising project,” said Bob Carter, senior vice president of automotive operations of Toyota Motor Sales, USA, Inc. “ISC and Daytona International Speedway will provide strong platforms to interact with our guests and most importantly, our race fans. FORT WORTH, Texas – Duck Commander, the brand of the best-selling duck calls and name of the thriving family-owned company led by the Robertson clan of A&E’s “Duck Dynasty” fame, has signed a multi-year agreement to serve as title sponsor of the annual spring NASCAR Sprint Cup Series race at Texas Motor Speedway. The largest-attended, single-day sporting event annually in Texas with estimated average crowds in excess of 150,000 will be known as the Duck Commander 500 with this year’s edition scheduled for Sunday, April 6. The two sides agreed to a three-year deal with a renewal option for an additional three years, but no financial terms of the agreement were announced. While the Robertson family emerged in the public eye and garnered immense popularity through A&E’s “Duck Dynasty” reality show that premiered in 2012, the Duck Commander brand has been the foundation of the family business of duck calls since patriarch Phil Robertson founded the company in 1972 in West Monroe, La. Duck Commander has since flourished into a multi-million dollar business with Willie Robertson, one of Phil’s four sons, serving as the CEO of the enterprise that now encompasses more than 1,000 Duck Commander products and a powerful stable of licensees. This race entitlement diversifies Duck Commander’s business portfolio and will be unique in structure as the company will utilize their exclusive licensees to fund this sponsorship for the exposure and opportunities to align their product with their brand. The Duck Commander brand also will enjoy a substantial product presence on its race weekend and throughout the year at Texas Motor Speedway. An extensive line of Duck Commander 500 merchandise will be sold at track and in the Speedway World souvenir store year-roundin addition to being available through Duck Commander retail partners. Uncle Si’s Tea™ will be introduced and sold at track in single-serve options in both the sweet and unsweetened varieties. Texas Motor Speedway also will look to integrate products such as Duck Commander Family Foods’ BBQ sauce, salsa and beef jerky with the speedway signature concession items. The Robertson family members also will have a strong presence on their race weekend, with several attending as well as having various VIP or honorary roles such as Grand Marshal or Honorary Starter. 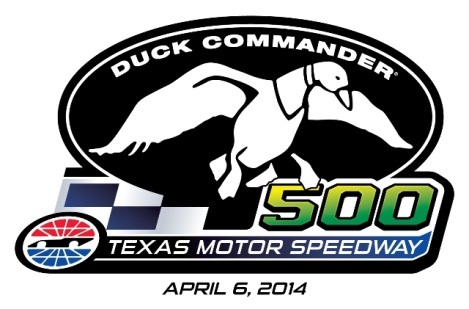 Tickets for the Duck Commander 500 officially go on sale Friday, Feb. 14. Fans interested in purchasing tickets prior to that date can do so by securing season tickets or by joining the Texas Motor Speedway Fan Club. Fan Club members will be eligible for a special Duck Commander 500 pre-sale event that begins 9 a.m. CT Friday. For those interested in the Fan Club, please visit www.texasmotorspeedway.com/fan-zone/join. Copyright © 2012 TracksideTimes. All Rights Reserved.